Dolly Parton is the proud owner of two new listings in the 2018 edition of the Guinness Book of World Records. Parton is the only artist to have top twenty hits on the Billboard Country Songs chart over six decades, from the 1960's to the 2010's. Her first came in 1967 with "Something Fishy" and her last in October 2016 with her remake of "Jolene" with Pentatonix. That version of "Jolene" was her 107th country chart hit, giving her the second record of most songs on the Billboard country chart by a female vocalist. 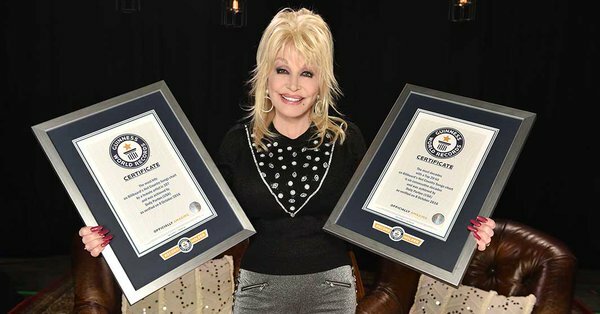 Parton said "To receive these two Guinness World Records is so great. Joining so many wonderful singers and songwriters who have been honored this way feels so special to me. You never know when you start out with your work how it’s going to turn out, but to have these two world records makes me feel very humbled and blessed."